How about shaking up the kids' baon for a change? Here's a quick yet yummy meal the kids will love! 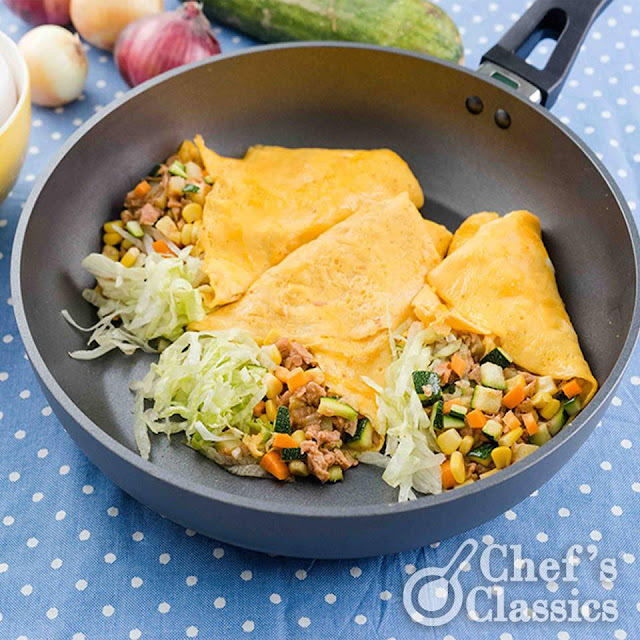 Learn how to cook a corn tuna egg crepe.Simple yet bursting with flavor! 1. Wash and prepare all the ingredients. 2. For the egg crepe, whisk the eggs, milk and salt in a bowl. 3. Using the Chef’s Classics Safflower Frypan, scoop a small portion of the egg mixture. Pour it into the pan and spread evenly by tilting the pan. Cook in low heat for about a minute. Set aside. 4. For the filling, sauté the onion, garlic, carrots, potato, corn kernel and corned tuna in the same pan for about 5 to 8 minutes. Add the zucchini and half of the lettuce. 5. In a container, place an egg crepe then spread the filling. Top it with lettuce and grated cheese then fold the egg crepe into a quarter. Squeeze some mayonnaise on top to add flavor.